House Preparation and Brooding in the Face of Fuel Shortages – Jones-Hamilton Co. In the face of fuel shortages and high fuel costs, growers often make decisions regarding house preparation and brooding that they would not have made under rosier circumstances. In such events, these decisions can either minimize impact or cause harmful consequences from which the flock tends not to recover. Regardless of the amount of down-time between flocks, the first and easiest thing a grower should do is close empty houses to preserve as much heat in the house as possible. Houses should be closed as soon as the live-haul crew leaves the house instead of waiting for the entire farm to be emptied. 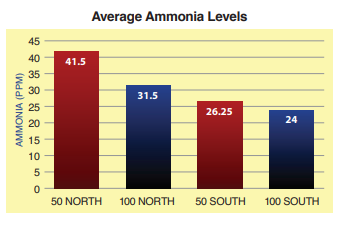 Utilizing the heat in the litter from the previous flock helps reduce the amount of ammonia that needs to be managed at the beginning of the next flock. It also serves to protect the interior of the house from the temperature and humidity swings that occur outside. Especially in the winter, closing the house soon after catch can keep the floor 20-30˚F warmer than it would be if the houses were left open. Retaining that heat greatly decreases the amount of fuel necessary to pre-heat the house to the proper temperature and to get uniform floor and litter core temperatures quickly during the pre-heating process. litter amendments are placed and before chicks arrive. The most critical and efficient time to use fuel in a house is during the pre-heating process when the house is empty. When fuel supplies are tight, this is the first place that most growers are tempted to cut fuel use but it actually creates the most harm. While the house is being pre-heated, it’s only necessary to run enough fan time to prevent condensation in the warmest parts of the day. It is NOT necessary to run minimum ventilation during the pre-heat process. Air quality at brooding is greatly impacted by pre-heating of built-up litter. Pre-heating is the main way to cure the litter and prepare it for the next flock. In flocks raised on built-up litter, adding heat to the litter initiates a large ammonia purge and this purge needs to be completed BEFORE bird placement. The increased contact time between the warm air and the floor is what completes the litter curing. Extending the pre-heat to 48 hours to allow this to occur will not burn significant amounts of fuel if minimal ventilation is done properly. In fact, proper pre-heating will lower overall fuel usage. By removing ammonia and achieving floor and litter core temperatures before birds arrive, ventilation demands post-placement are reduced and floor temperature is maintained rather than lost through excess ventilation. A 48-hour pre-heat allows for warmer and more uniform floor temperatures both deep in the litter and side-wall to side-wall which enhances bird comfort and reduces fuel usage during the rest of the brooding period. Running a short pre-heat time in a misguided effort to save fuel will not warm the house and the litter properly. Birds will feel the impact of cool temperatures at the litter core and performance loss and mortality is the end result—not fuel savings. Since the purged ammonia from pre-heating accumulates in the house even with minimal ventilation, it should be exhausted all at once with a quick period of maximum ventilation. This should be done either immediately before application of the litter amendment or, in a house not receiving an amendment, an hour or two prior to chick placement. From this point on, standard minimum ventilation for the brooding period can begin. DO not be concerned about the loss of air temperature in the 10 minutes it takes to purge the house of released ammonia. Floor temperature will not be lost and the air temperature will quickly return once the brooders are turned back on. Failing to purge out the released ammonia will result in a loss of 4-5 days in longevity of PLT® which will cost far more in terms of fuel and bird performance. Again, proper house pre-heating should begin at least 48 hours prior to chick and poult placement to ensure proper litter temperature. In houses that are not properly preheated, litter temperature can be as much as twenty degrees lower than the air temperature. This provides a perfect way for chicks to be chilled. Birds that are placed on a cold floor spend more time trying to keep warm than eating or drinking. Numerous researchers have reported that birds placed on floors even as little as five degrees cooler than optimal temperature gain significantly less weight than when placed on warm floors. Chicks and poults are unable to regulate their body temperature for the first 72-96 hours of life and chilling places them under a significant amount of stress. The temperature of the litter at placement should ideally be 93-95°F and the core litter temperature at least 90˚F at the time the chicks are placed; maybe even 5-10˚F higher for poults. It is important that actual litter temperature be observed and not air temperature. This can be done with a calibrated infrared thermometer or with a simple Taylor thermometer inserted into the litter. It is important to verify bird comfort through visual observation and not to rely on the set points on the controller system. Chicks and poults should be active, well spread out and eating out of the feed pans and feeder lids. Birds that huddle, congregate under the brooders, avoid brooders completely or only sit in the feed without eating are not comfortable regardless of what the sensors are recording. The use of an ammonia-binding litter amendment is also quite critical in order to maintain air quality in the face of restricted ventilation. Using PLT® at the proper rate and application method is key to its longevity. A fuel study completed in both northern and southern climates compared a lower than recommended rate of PLT® application to the proper recommended rate on fuel usage. In northern climates, the houses that used the proper rate of PLT® saved almost 600 gallons of propane compared to houses on the same farm using the improper rate. In the southern farm, the fuel savings was just over 300 gallons. A typical fuel savings of 40% or greater per house can equate to a lot of dollars not wasted if the right steps are taken prior to birds being placed. Current fuel prices of $3.50- $6.00 a gallon can equate to a lot of money, in fact, based on the above farms where 300 -600 gallons was saved, the dollar amount today would be $1200- $3600 per flock. producers cannot afford cold floors nor can they afford to waste fuel during the current fuel crisis. Close houses immediately after birds are caught. Keep houses closed unless they are physically being worked in at the time. Run only enough fan time to prevent condensation within the house. Pre-heat at least 48 hours in advance of bird placement to get uniform litter core temperatures in the house. Do not run fans except to prevent condensation. Pre-warming will reap big advantages once birds arrive and uses less fuel than heating while the house is occupied. Use the recommended rate of PLT® for your litter age and down time. Consider using additional product to extend longevity. Don’t forget to check relative humidity each morning and increase ventilation slowly as needed to maintain humidity below 70%. This prevents litter caking and reduces ammonia generation.